We are pretty excited about Frio. This cooler is something else. 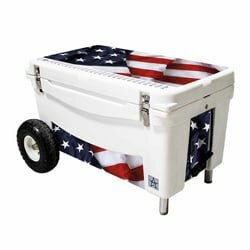 Their website says these coolers and their other products were made in Texas, by Texans, for us. 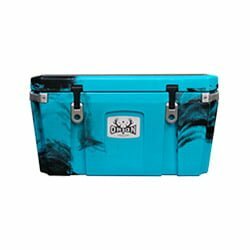 Now, what is so exciting is just how much went into the design of these coolers. 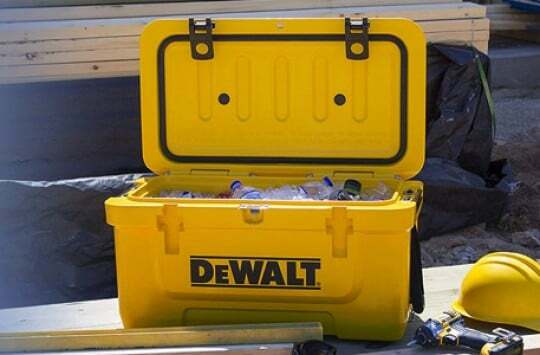 They are, without a doubt, some of the toughest coolers we have ever come across anywhere in the world. From the roto-molded construction to the ice retention capabilities in different extreme temperatures, everything is just remarkable. But we’re getting ahead of ourselves. No need to spill all the beans just yet. Allow us to take you on a personalized tour of the best thing to come out of Texas since corn dogs! This ice chest was built to last. It certainly looks dainty when you come across it for the first time, but don’t let that fool you. This roto-molded beast can hand anything from fires to drops from great heights. The good people at Frio have posted a few videos showing them taking Frio coolers through some tough tests. The Frio coolers survive through all of them. One of them involves exposing the Frio to very high temperatures. These temperatures are so high that the plastic on the outside of the cooler begins to char. Afterward, they open the industrial grade steel latches on the lid and have a look inside. The ice is still intact! Another test involves carrying taking the cooler into a single-engine plane and dropping it from 55 feet in the air. It has glass bottles inside. Not only is the fall spectacular, with the cooler bouncing once before settling, but the glass bottles inside are still intact! We rarely ever get pleasantly surprised by a cooler, but this is one of those rare times. This beast might just be on its way into the hall of durability fame alongside other industry leaders like Pelican or Orca Coolers. Apart from the strength of the cooler’s body, there are also a lot of other things that went into the design that you will appreciate. The latches aren’t plastic like we’re used to seeing on most coolers. 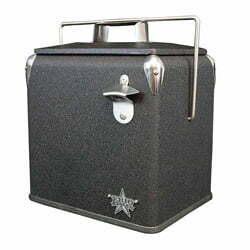 The guys in Texas must really be serious about securing their coolers because we can’t think of any other explanation for the fact that they installed stainless steel latches on these coolers. These things aren’t coming off easily. You lock them, they stay locked till you open them again. 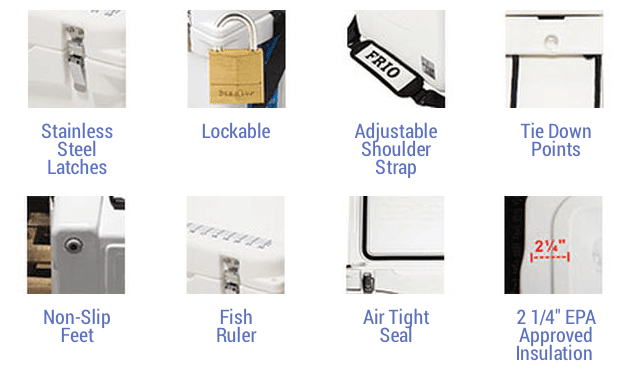 Not only are the latches heavy duty, but the lid is air-tight too. The gasket is 2 inches thick, and the lid does a good job of keeping the cold in and the warmth out. Frio ice chests have excellent handling capabilities. 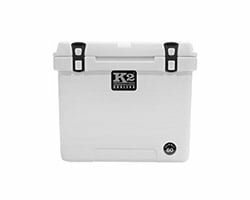 They have handles on either side of the cooler, meaning you can carry your cooler without having to worry about the contents sloshing around. The handles on the Frio aren’t just any handles either. 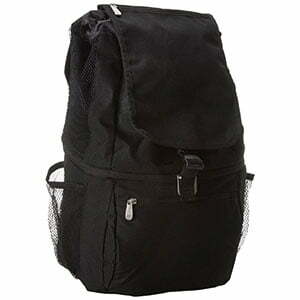 They are made of heavy-duty nylon rope with strong plastic handles. The grip on these handles is something else, and the nylon rope will serve you for many years without you ever having to worry about it snapping. We also love the fact that the smallest Frio, the 25 qt, has an adjustable shoulder strap. That means you get extra carrying options. The Frio also has tie-down points on both sides so you can easily secure it to your vehicle when you’re on the road. If you’re worried about it slipping around, you’ll be happy to hear about the 4 non-slip feet that keep it locked down on any surface. 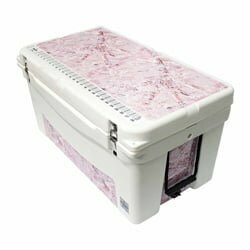 The ice chest on the Frio is well built, with thick foam insulation and a motion-sensitive light. We particularly liked the motion-sensitive light idea. You don’t have to open the ice chest, switch on the light, and then look for whatever it was you were going to get in the first place. Things are as smooth as the light switching on as soon as you flip the cooler lid open. It’s like using your fridge at home, only this fridge is way cooler and is your companion on your trips outdoors! The ice retention on the Frio might be its weakest point, but it’s still pretty good, even by industry standards. 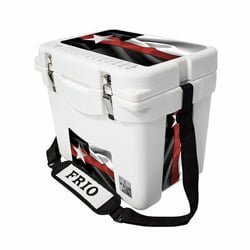 According to the Frio website, if the cooler is pre-cooled before adding ice, and stored in temperatures below 90 degrees Fahrenheit, it will easily keep the ice cold for a good 5 days. If the environment has a temperature above 90 degrees Fahrenheit, the cooler will last between 3 and 4 days. Such result is perfect for most purposes. We didn’t mind it in light of all the other great features the Frio has. In this sector, the Frio offers a lot of options. In terms of actual cooler color, each cooler can only be either white or tan. However, there are tons of extra options, such as surf ‘n turf coating and the American flag option. On the 25 qt cooler alone we counted at least 43 design options for what goes on the 5 sides of the cooler. And these are the manufacturer’s options. 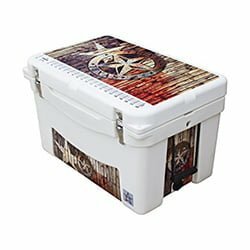 We haven’t even gotten to their great customization program where you can practically design what your cooler will look like from scratch! There are 4 available sizes for the Frio: the 25 qt, the 45 qt, the 65 qt, and the 65 qt extreme, that comes with a set of wheels (more wheeled coolers here). All of these can be customized at the request of the customer. 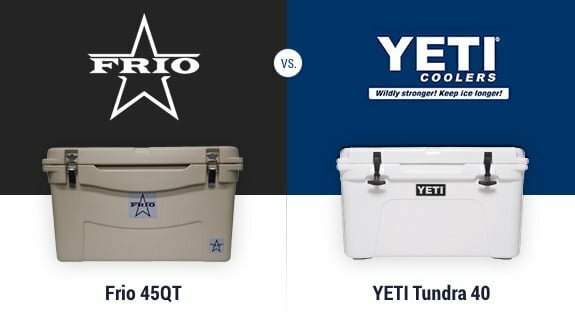 In an industry where many coolers are practically ripping off Yeti’s design (check here), we love the fact that the Frio cooler isn’t exactly the same. Sure, the overall shape could almost pass for a Yeti, but Frio goes out of their way to look a bit different. The steel latches, in particular, are a good touch. Yeti, as usual, is the more prominent brand in this case. However, Frio, while the underdog, isn’t necessarily of lower quality. Frio just happens to be less widely known than Yeti. Change that and give it the fame it deserves and we believe this brand could provide some serious competition for Yeti. Both of these coolers are beasts when it comes to build quality. Yeti coolers are well known for how well they can handle anything from fire to drops, to hungry bears trying to pry them open. 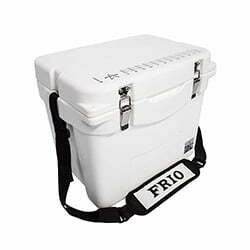 Frio coolers have also proven themselves if the tests we’ve seen are anything to go by. They actually remind us of Icehole coolers a bit. Regarding available sizes, Yeti takes the cake. The Yeti Tundra and Roadie series are well varied regarding available sizes, and this is a massive advantage for them. When it comes to colors, it would seem Yeti still wins, with Frio having only two base colors. 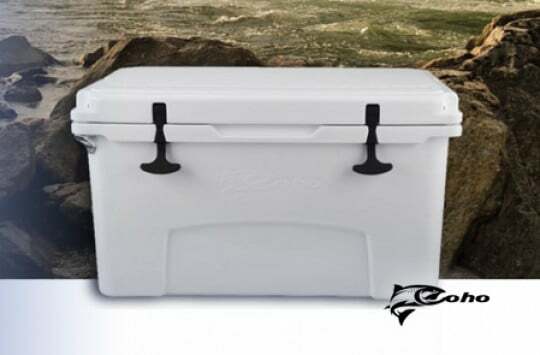 However, Frio’s design options are numerous and make it a possibility to give every Frio cooler a unique cooler without having to buy extra accessories on the market. We’re calling a tie here. While it’s possible to buy lots of third-party accessories and customize your Yeti cooler, Yeti doesn’t have a customization feature like Frio, where you basically get to design your cooler from scratch and have it delivered to you looking just the way you want it. We’re giving this one to Frio. 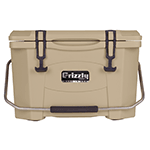 Yeti coolers are designed in the USA and made in USA, China and Philippines (depends on the model). Frio coolers are designed and built by Texans in Texas. This one goes to Frio without debate. Frio coolers certainly aren’t cheap. They are best described as mid to high end. However, they are still less expensive than Yetis and offer the same build quality and almost the same ice retention. Given the price and all the features that come with the Frio, we’ll have to say it offers more value for money. 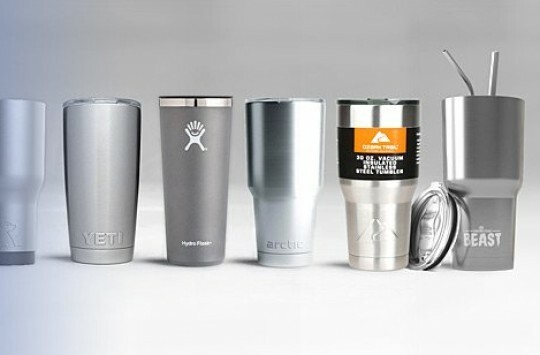 Yeti is popular because it has already established a name for itself in the market. Frio is an underdog, but it offers Yeti-like quality at a lower price. While Yeti’s ice retention is superior and it has more sizes and colors available, we feel that Frio’s customizability and build quality more than make up for that. Unless you want something well known, we strongly recommend getting yourself a Frio. If you thought Frio’s products ended at hard-sided coolers, you’re in for a pleasant surprise. Frio offer soft coolers, tumblers, bottles, and, their iconic retro coolers. What do you think? Let us know in comment section below.